The routine Gun Runner has gotten himself into would be considered monotonous if it wasn’t so spectacular to witness. Put the chestnut colt in the starting gate, hang the weight of expectations on him, and watch him deliver in devastating fashion. See his rivals give all they have, watch them try and pressure his game, and see them crushed by the impact of his ability. The 4-year-old son of Candy Ride continued his wash, rinse, repeat pattern of excellence Sept. 2. 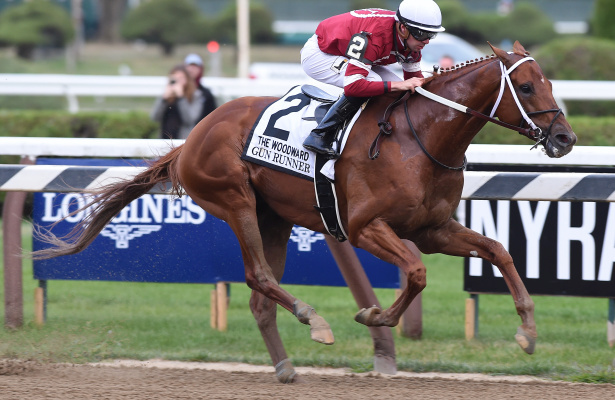 In his most emphatic result during a season that already boasts multiple statement-making efforts, Gun Runner rolled past pacesetter Neolithic on the far turn and drew off in the lane en route to a 10 1/4-length win in the Woodward Stakes Presented by NYRA Bets (G1) at Saratoga Race Course. If there has been a constant the racing community can count on in 2017, it is the form of the colt Hall of Fame trainer Steve Asmussen has been masterfully building to a crescendo. The only loss the chestnut dynamo has suffered in his last six starts came when he finished second to champion Arrogate in the March 25 Dubai World Cup Sponsored by Emirates Airline (G1). With that gray rival enduring back-to-back losses since returning from Dubai, Gun Runner has snatched away the balance of power in the handicap ranks. His Woodward score was the fourth grade 1 win of his career and third straight top-level victory, which came on the heels of his 5 1/4-length win in the Aug. 5 Whitney Stakes (G1). That effort followed his seven-length glorified workout in the June 17 Stephen Foster Handicap (G1). He has also never lost in the six times he has gone to post as the favorite, and Saturday’s outing was more of the same for the overwhelming 3-10 choice. “He stepped up. He was carrying everybody—all of us—under these circumstances,” said Asmussen, who also won the Woodward in 2008 and 2009, respectively, with future Hall of Famers Curlin and Rachel Alexandra. “We all know what’s happened over the past couple of weeks. If we can get out to California in good shape, we’ll hope to finish off the year. Many an upset has gone down over the famed Saratoga oval. Any notion Gun Runner would be added to that list was killed with about three furlongs to go in the 1 1/8-miles test. The Todd Pletcher-trained Neolithic, third in both the Dubai World Cup and Pegasus World Cup Invitational Stakes (G1), tried to bring the heat when he held a two-length advantage over Gun Runner, who rated in second through fractions of :23.20 and :46.56. Jockey Florent Geroux, aboard the eventual winner, was already looking over his shoulder for threats at the half-mile mark and when he let Gun Runner creep up on Neolithic in the final turn, the only drama left was how visually impressive the final result would be. “That was better than the Whitney—stronger, faster,” Geroux said. “Overall he is just getting better … and he is doing good on the track. And I don’t think he is 100% cranked up yet. I really do think he has another step forward (in) him. Owned by Winchell Thoroughbreds and Three Chimneys Farm, Gun Runner covered the distance in 1:47.43 on a fast track to earn his 10th win from 17 starts. He bolstered his earnings to $5,738,500. Rally Cry finished second and Neolithic faded to third. War Story and Discreet Lover completed the order of finish. Bred by Besliu Stables, Gun Runner returned $2.70 and $2.10 with no show wagering offered. Asmussen said that he would train the colt out the Giant’s Causeway mare Quiet Giant up to the Nov. 4 Breeders’ Cup Classic (G1).